The concept of the game seems interesting, but I couldn't enjoy it. Most of the times I feel the game ignores my actions. Having to press enter to release a piece and take another one is self-defeating, a drag and drop approach could work much better. It is pitiful that the game feels broken and that it has that control scheme (I agree with most of the other comments, they're not intuitive). Despite that, I like the aesthetic of the game. I like the idea and the minimalistic art style. However, using the keyboard number was really counter intuitive for me. I would have prefer drag'n dropping with the mouse for example. Okay so first of all I really love the art! Took me a while to understand the control at first, but after a while it became smooth, I still wish it would have been easier to control like not having to press enter for example but overall its pretty fun! Nice entry! thank you for your feedback, we are exited to hear you had fun woth our game! Nice concept! I just wished the controls were easier like clicking the same number would place it down rather than enter, kinda makes it hard to react with everything. Still had fun tho :) Good work! It is good to hear that you had fun with our game! Thanks for your feedback! thank you for your feed back! You are right it could very easily evolve into a typing game! 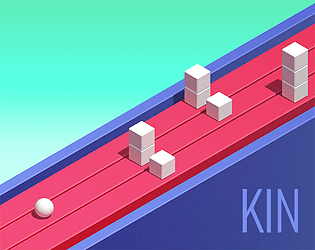 Needing to deselect after picking the wrong block took a while to get used to, but once I got the hang of it, Kin became a very zen experience. The smooth art style and soundtrack are both fantastic, I really enjoyed playing this! Im excited you feel that way about our game, thanks! Neat idea. Index finger on enter, middle finger on left and ring finger on right works pretty well, could even use some speeding up after a while. thank you for your feedback, it does speed up but at a very slow pace. Ultimately reaching 2X or 3X . It was really hard to control. I would ditch the "press enter" and maybe loop the tracks so if Im on the left most lane and im pressing left it will got to the rightmost lane. thank you, we had both ideas for controls (enter and without enter) but we did not had time to test both. We went for the option with enter because we thought the extra difficulty was good. Next time we will think about user experience first haha. Nice idea! The visuals are really great, and I actually like the camera angle - but it did sometimes cause blocks to be hidden behind others. It might be useful to add some logic to prevent generating blocks in places where they'd be difficult to see. Thanks a lot for the feedback; Yeah, we know the controls are crappy - we didn't have time to debug that part correctly :/ Thank you for playing :) !